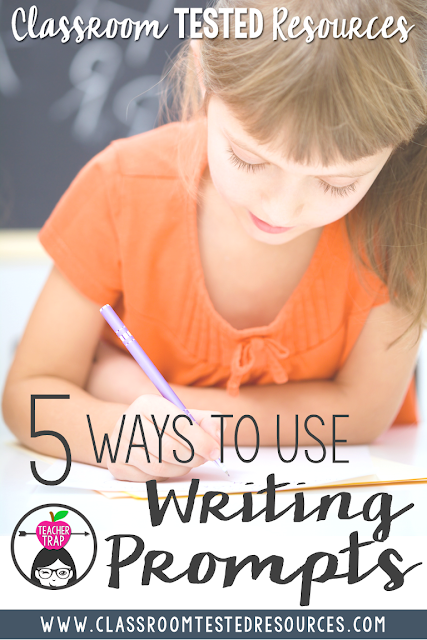 We've all used writing prompts for independent writing time or writing centers, but they have so many more uses! In this post, I'll share some new ideas for using prompts, plus some fun prompts that you can use today in your classroom. Many students arrive at school with their heads full of BIG thoughts. They might be thinking about things that happened at home or feeling anxious about the day ahead or simply wishing they were at home playing video games. By launching the day with quiet writing, students can refocus and recenter. Use prompts that allow kids to get out those early morning stories, worries, ideas, etc. Then you can use their writing for a quick morning share time! * What would you most like to share with your teachers and friends this morning? * How can your teachers and friends help you have an awesome day? * Imagine that today was your very best day at school! What happens? * What do you miss most about home when you are at school? Why? For many children, writing feels like an impossible and lengthy task. Quick writes are a great way to remind students that writing can be a fun and fast-paced way to get ideas out of their heads! Just share the topic and set a timer for 5 - 10 minutes. Quick writes are great for opening and closing lessons, giving "think time" before sharing verbally, and encouraging students to synthesize their thinking about a book or new concept. * Write everything you know about the water cycle. Go! * Write about a time you felt terrified. * What does it mean to be hero? Partner writing is a powerful way to help students grow ideas AND writing skills in a supported setting. Writing with a buddy allows students more time to talk, think, and clarify ideas BEFORE putting them on paper. This is especially useful for reluctant writers or impulsive writers who rush through putting the words on paper without planning. I love using partners with procedural texts and fiction writing. With procedural, students can first talk through the process and then have a second set of eyes to make sure their plan makes sense. With fiction, students can get creative together, building off each other's ideas. * Imagine you found a hidden door in the school. Write a story about what happens next. * Write a story about the day you learned to fly. * Write a recipe for making your favorite snack. * Write directions for how to play your favorite game. When helping students learn how to recognize different genres and their purpose, I like to have sets of writing prompts handy! Prompts can be sorted by genre or author's purpose, students can generate their own prompts to add to categories, or you can pull out a certain set of prompts based on the unit of study. For example, if you're working on a persuasive writing unit, you can have those prompts available for students to choose from. * Persuade your parents to get you the pet you've always wanted. * Convince the principal to extend recess time by 5 more minutes. * Where should the class go on the next field trip? Convince your teachers and classmates. Certain times of the day, such as right after lunch or recess, can be difficult transitions for kids. Special events such as field trips, programs, and holidays, can also add chaos and uncertainty into the school day. When things get a bit too wild, I love using a writing prompt to slow down the day and refocus the class. You can choose a prompt related to the day's event or post a few options and let the students decide. After ten or fifteen minutes of quiet writing time, the class is usually calm and ready to restart learning. * What is your favorite memory from today's field trip? * What were your favorite parts of today's author visit? * Write a story about an unexpected event at recess. * Create a story about the day you picked up a talking apple at lunch. I'd love to hear about other ways you use writing prompts in the classroom. 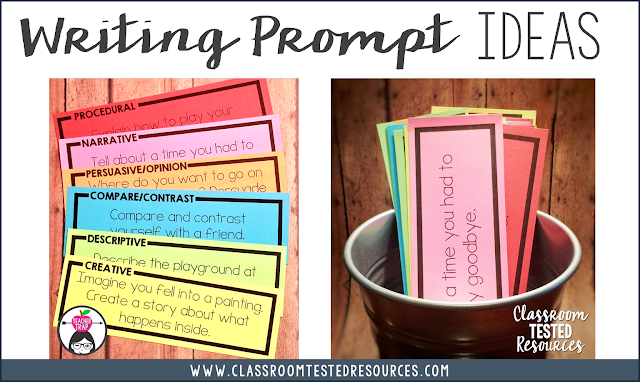 And if you're looking for ready-to-go prompts, you can check out my collection of Writing Prompts by Genre on TPT. Thank you so much, Kady. I always look for ideas for writing.